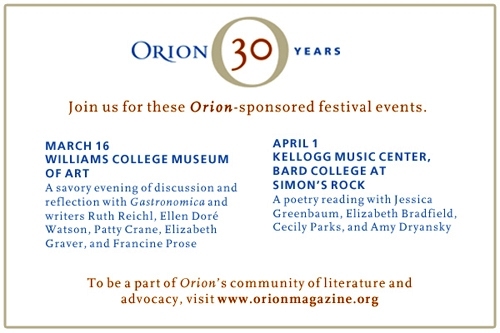 At this very time, just a hop, skip and a jump away from anywhere in the MA, CT or NY state conjunction, really fabulous writing-related events featuring talented, funny and smart women are taking place, all during the month of March and even a wee bit into April. What is this thing? Where? How can I go? You ask. Pokey will reveal all. Actually, you can just follow this link. I think it’s going to be fun—and do take a look at the complete schedule; they’ve got everything from found word collage and self-publishing to international women’s rights and film. My friend Ellen Watson is part of this crazy thing with Gastronomica magazine about food and art and writing. I’m going. Not only do they have good writers in the Berkshires that also have some really good restaurants. Lots of the events are free. I don’t think you even have to dress up. Unless, of course, you own a pair of red pants. Then you should definitely wear those. Oh, and if you’re not familiar with Orion or Gastronomica, they are both beautifully made journals with lots going on. Take a peek, maybe they’ll have cookies! Come on out–you know some women, don’t you? Some of them are probably writers, right? And you need a night out, don’t you? A road trip? Yes, Pokey knows you do. Pokey does, too.